Verizon, for example, says its faster speeds will only kick in like a turbocharger on a car engine, when a customer is downloading a lot of data at once. Otherwise, customers “will continue to enjoy typical download speeds” of 5 to 12 Megabits per second, or Mbps, Verizon VZ -0.44% says. And while the maximum possible speed of LTE-Advanced is 225 Mbps or more, even when carrier aggregation kicks in, customers’ maximum download speeds will increase generally by only 50% over regular LTE, Verizon says. CradlePoint Announced the AER 3100 and AER 3150 (no WiFi) Advanced Edge Routers. The Cradlepoint AER3100 features dual modems for wireless-to-wireless failover or augmented bandwidth to optimize support for high-performance applications—like employee/guest WiFi, digital signage, point-of-sale systems, and surveillance—to meet the growing needs of small and micro branch networks. Cradlepoint’s AER portfolio is the only line of 4G LTE network solutions to offer dual-modem multi-carrier support, Unified Threat Management (UTM) capabilities, and the industry’s most robust cellular WAN management application platform, Enterprise Cloud Manager. CradlePoint announced the ARC CBA850 cellular gateway yesterday which includes out-of-band management. Cradlepoint released a new M2M gateway that will be available soon, the IBR350. This is a non-rugged indoor device, with a plastic enclosure. It is primarily targeted at ATMs, Kiosks, digital signs, and telemetry applications. Because its non-rugged, its meant for indoor stationary use only. Vehicles and mobile applications should still use the IBR600/650. Trakdot Luggage™ is designed to provide airport-specific location information for your checked luggage. 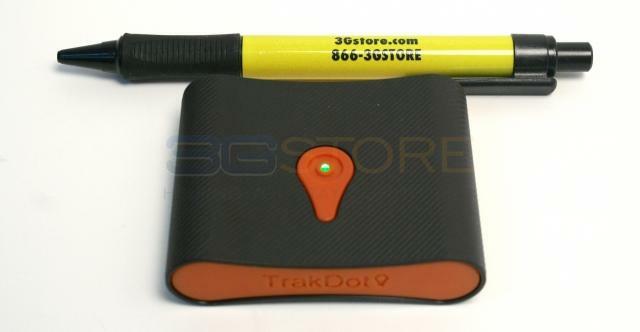 Trakdot™ Luggage is constantly monitoring the cellular network to determine its city location. When you fly, Trakdot™ Luggage knows and goes to sleep. Upon arriving at your destination, Trakdot™ Luggage wakes up and reports its new location. Depending on your preferences, a text-message or email is sent to you confirming that your luggage has arrived with you. Pepwave/Peplink’s Balance and Max series of routers have become enormously popular with enterprise users and networking gurus thanks to their unrivaled feature set, but their price puts them out of reach for some users, and not everyone needs all of the advanced features these routers offer. Enter the Pepwave Surf SOHO, Pepwave’s new 3G/4G WiFi router aimed at the home and small office market. The Surf SOHO offers a number of the most-used features offered by Pepwave’s higher-end enterprise routers, including 3G/4G USB modem support, failover, WiFi as WAN, QoS optimization, bandwidth monitoring, and advanced VPN functionality (“PepVPN”), but its affordable price tag (MSRP $129.99) and easy-to-use interface make it perfect for home and office users looking for a quality networking solution without breaking the bank. Peplink introduces what they consider may possibly be ‘the World’s Easiest VPN.’ PepVPN is what builds the foundation to Peplink/Pepwave’s SpeedFusion services, which include SpeedFusion Hot Failover and SpeedFusion Bonding. Peplink’s three-tiered structure for PepVPN gives any customer, consumer or enterprise, the option to start simple and expand from there. Starting with the first tier, PepVPN, you’ll notice it’s quite similar to IPsec VPN, but offers more benefits than your traditional IPsec VPN capable router. First and foremost, the tunnel can be set up over any IP connection. So, as long as you have a public or static IP address from your ISP on at least one end, you’ll still be able to establish a tunnel between 2 Peplink/Pepwave routers. Pepwave will be releasing a new MAX Router this fall called the Pepwave Max On-The-Go. If you want to be notified when the Pepwave Max-On-The-Go is available, you can signup to be notified. This is going to be a very popular rugged 3G/4G Router with embedded 3G/4G. The need for reliable cellular connectivity is growing everyday in M2M (Machine to Machine), Telemetry, POS and travel industries. Coming soon is the new Pepwave Max BR1 unit, which will feature embedded 4G LTE, or a 3G embedded modem that supports virtually all cellular types (see below for full support). For large deployments this means you’ll no longer need to worry about which provider has the best coverage in an area, if you find Verizon isn’t working well a quick phone call and your Max BR1 can be activated on AT&T!